The Range Rover Evoque is now five years old, and it’s fair to say that in the last half decade the model has become the automotive choice of the rich and famous. 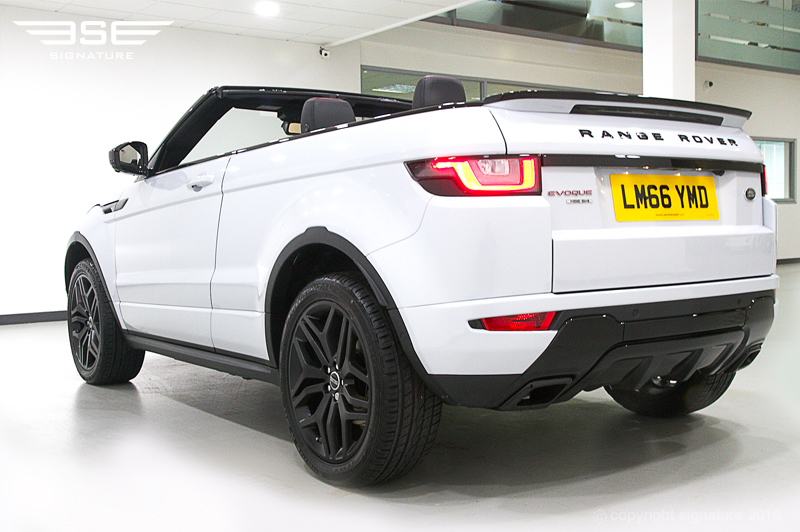 It’s easy to see why: it’s chic, effortlessly practical and more of a manageable size for urban areas. 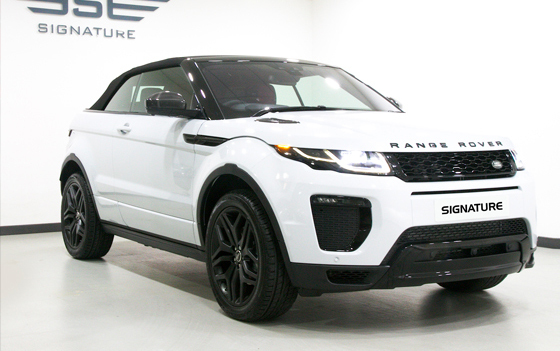 Yet it’s not ‘Range Rover Lite’, the Evoque can hold its own when the going gets tough, and is built with the same regard for strength, safety and all-round-performance as its larger cousins. 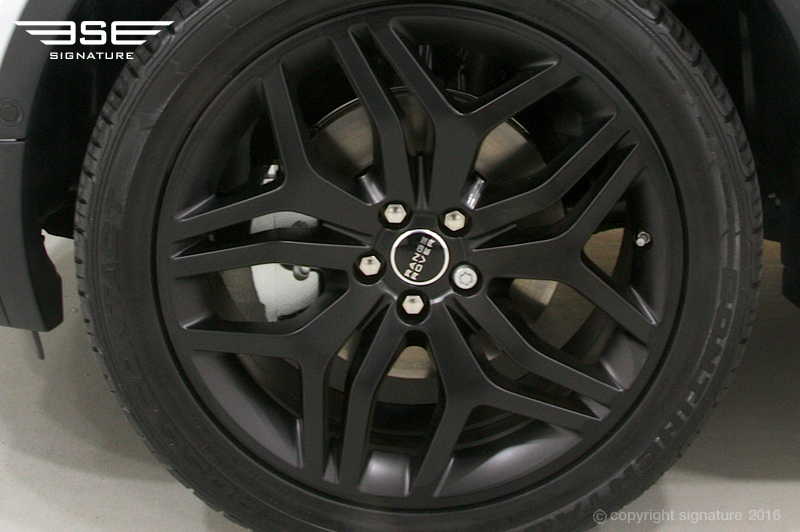 When it first emerged on the scene, the Evoque was hailed as groundbreaking and its distinctive shape was bound to turn heads. That’s still true today, but another – perhaps unexpected - feature of the distinctive shape was that it also lent itself to an original and elegant convertible design. If you’ve never considered a convertible SUV before then this vehicle will spoil you for life, offering as it does endless refinement, excellent performance and effortless luxury. 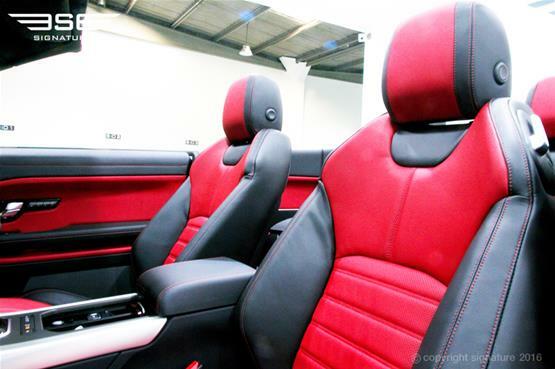 This is also one of the most comfortable and practical convertibles on the road, making it perfect for a wide variety of journeys and experiences. This UK-manufactured convertible SUV is underpinned by Land Rover’s world class all-terrain capability, and uses the same advanced tech as can be found on the regular Evoque models. 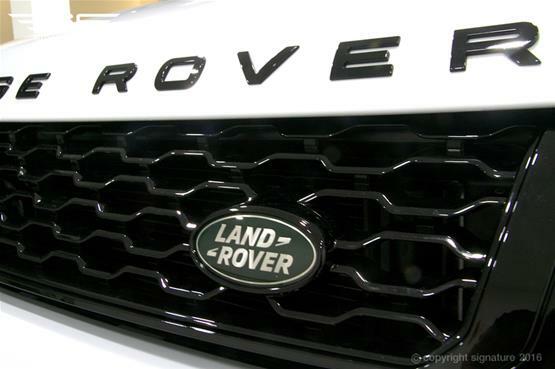 The four-wheel drive powertrain is combined with Land Rover’s nine-speed automatic transmission, the Terrain Response system, Wade Sensing and All-Terrain progress control, ensuring that you can truly go anywhere and everywhere. 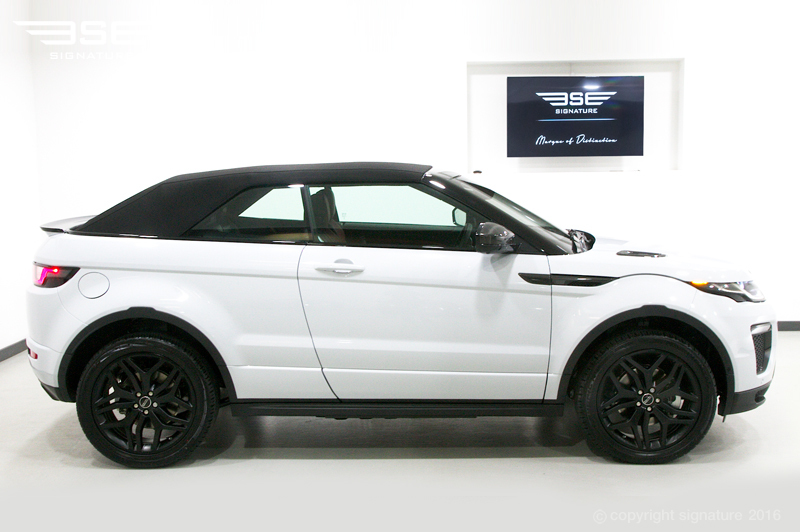 The Evoque convertible’s driver is further aided by LED headlamps, the latest driver assistance technology and autonomous emergency braking. 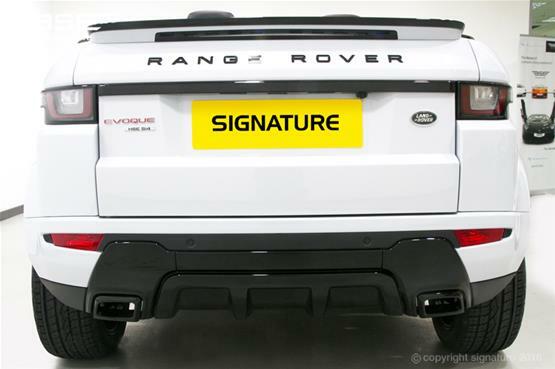 Underpinning the car are independent suspension and anti-roll bars which have been cleverly engineered to support the extra weight that’s associated with a folding roof. This car can and will tackle the vast majority of off-road situations – it can cope with 50cm of water, 35-degree tilts and 45 degree gradients, which covers all but the most extreme adventures! 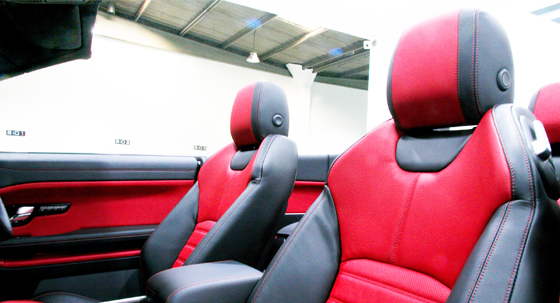 This is a truly chic convertible that also offers practical solutions for everyday journeys. 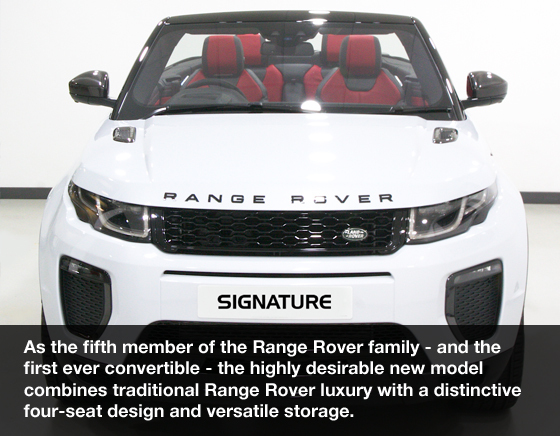 Whether you’re looking for something that helps you take your family on holiday in comfort and complete safety, or you’re attending a high profile event and need your car to make the right impression, this car is the perfect hire. 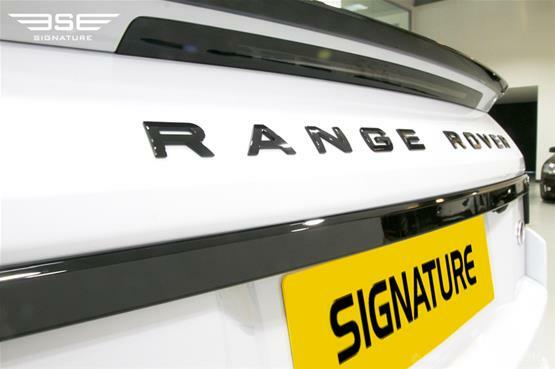 It’s a great treat for the driver, who benefits from the full suite of Land Rover tech, safety features and both off and on road performance, but also for passengers who’ll be snuggled into the soft leather seats and feeling thoroughly spoiled! While the design is still breathtaking, what most people will be immediately interested in is the roof. This sophisticated fabric roof is worked into a Z-fold mechanism which makes for a sleek, uncluttered appearance when lowered as it lies flush with the elegant rear body work. 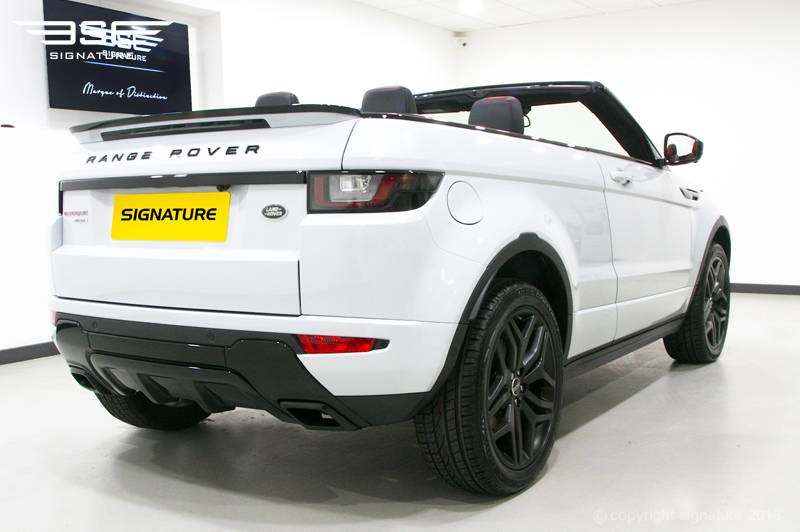 Not only does it preserve the car’s crisply defined silhouette in both up and down positions, but the roof is the longest and widest fabric canvass currently fitted to any vehicle on sale. 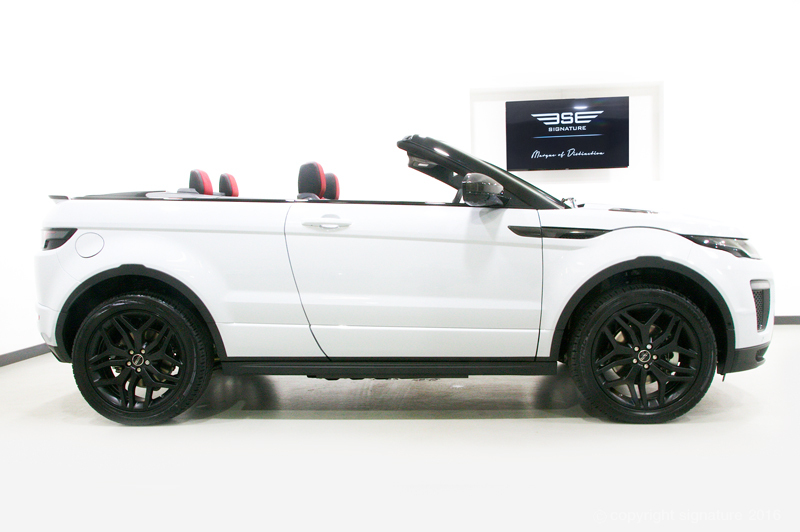 Fully automated, the Evoque Convertible’s roof can be stowed in just 18 seconds and raised in an equally speedy 21 seconds. 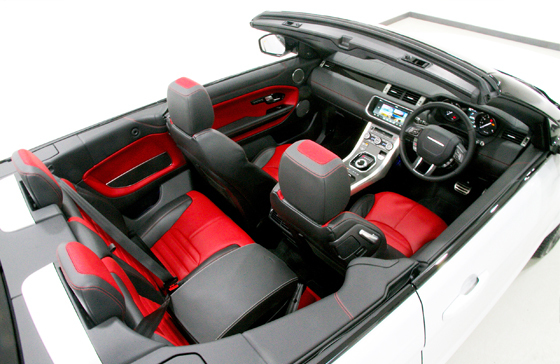 This functionality is available at speeds of up to 30 MPH – matching the functionality of most sports convertibles despite its larger size. When closed the roof provides exceptionally high standards of refinement, providing a layer of acoustic insulation and interior comfort that’s on a par with the regular five door Range Rover Evoque. We have both models in stock and you’re welcome to test this out for yourselves! 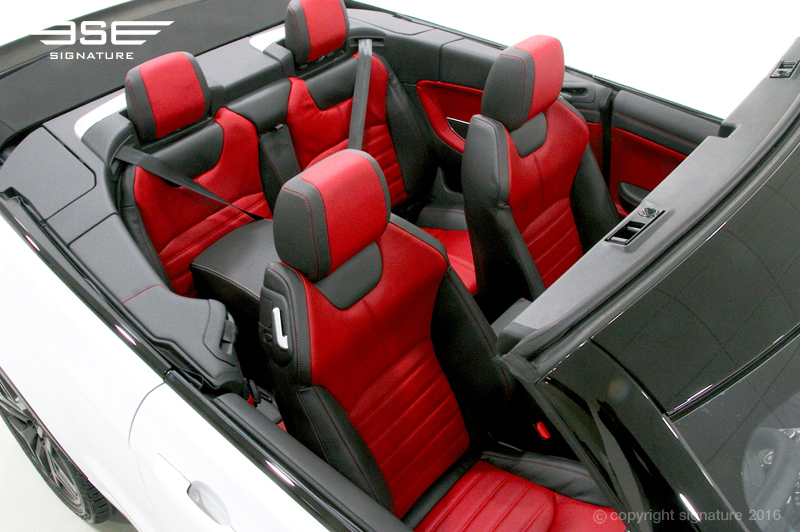 Despite the convertible roof the interior space is not less than on the regular model, and the loadspace is also generous, providing as it does 251 litres – more than most convertibles could ever dream of. One other brilliant feature of the bodywork is that it comes with a Roll-Over Protection device, which features deployable roll-over bars hidden at the rear. 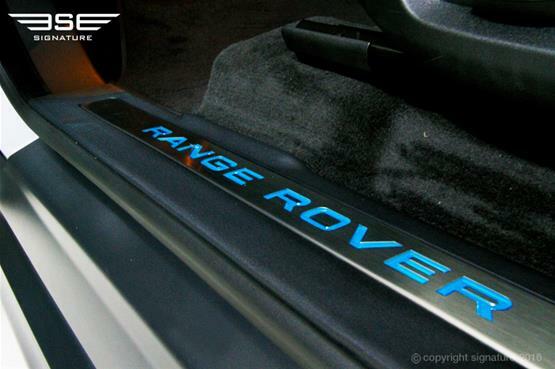 In the (highly, highly unlikely) event of a roll-over situation the device deploys two aluminium bars within 90 milliseconds, which create a survival space for the car’s occupants. The overall design is strong, with the muscular shoulders a key feature of this new Evoque convertible. 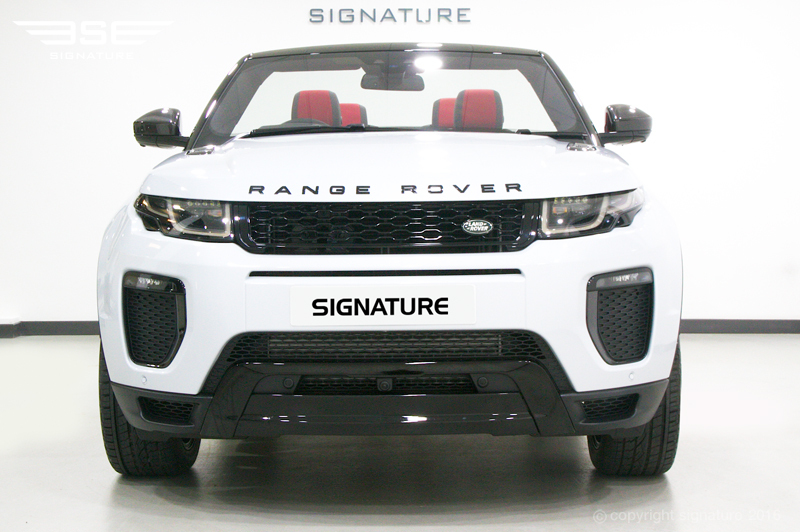 The car’s lines are striking, particularly on the tapered roof that so typifies the chic urban/country crossover style of the Range Rover Evoque. 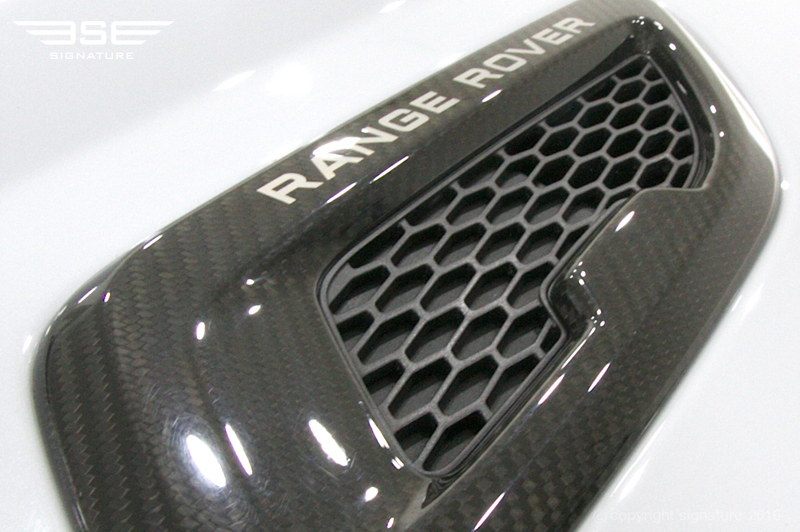 The rising beltline is very distinctive, as is the squarish rear which sets it firmly in the Range Rover stable. In the style stakes, as with everything else, this truly is a car you can take anywhere. 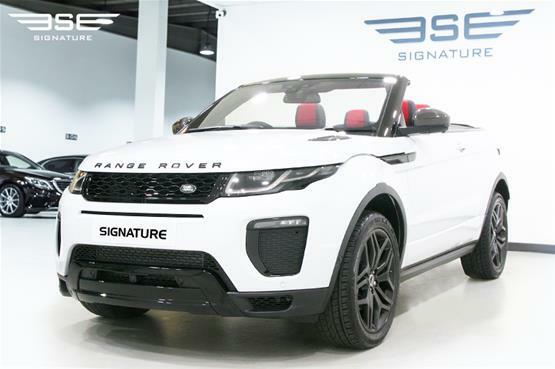 Although the convertible has lost one rear passenger seat compared to the standard Range Rover Evoque, the car has lost none of its luxury. 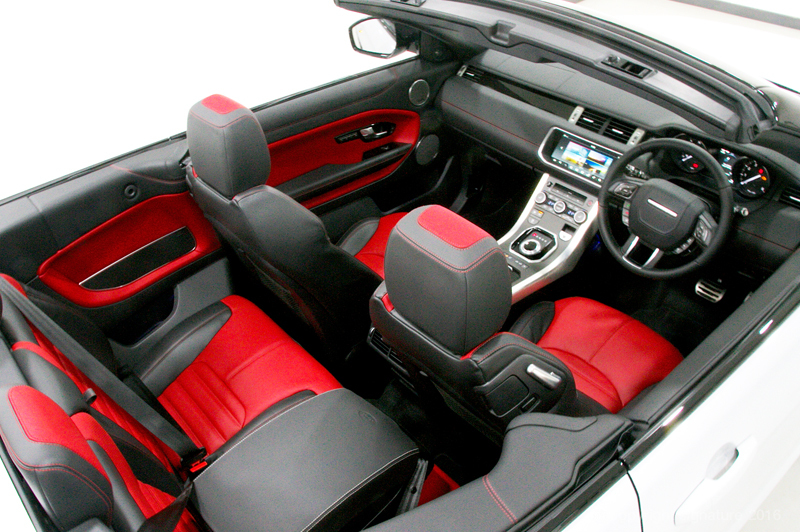 As well as the customary feeling of floating on a moving cloud, one which happens to come with sumptuously soft leather seats, the convertible also comes with the option to fix a wind deflector behind the front two seats – meaning that if just two of you are travelling you can enjoy the thrill of open-top driving without the messy hair. 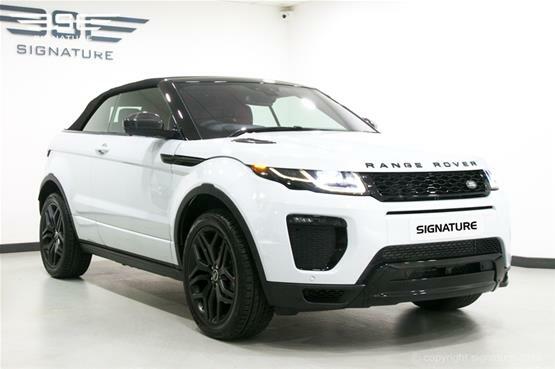 Jaguar Land Rover have added extra tech upgrades into the stylish interior of the Evoque convertible, most noticeable of which is the 10.2 inch touchscreen that’s loaded with the marque’s next-gen infotainment system, InControl Touch Pro. This offers a premium sound system, 3G connectivity, smartphone integration and door-to-door navigation.